Discussion in 'Modified 2011- 2019 Explorers - Tuning & Mods' started by kmarnes, September 18, 2016. Note: I've reposted this from another nearly unrelated thread. This is more of a "how I did it" thread, rather than asking a question. So it's taken a little while mostly piecemeal to get this thing setup properly, with a vacation in between. But first, let me tell you about this dashcam. The Thinkware F750 is a front & rear dashcam setup that has a constant power hookup for parking mode surveillance. It's got a motion sensor inside that will trigger recording in case someone hits you in a parking lot as well as independent motion sensing. Plus of course it captures both simultaneous front and rear recording while you are driving. It also has additional features that do forward collision warning, lane departure, speed limit warnings, red light camera warnings. Depending on which Explorer you get, you won't need those features and can disable them, like I did. While the parking mode is running and feeding off the car battery, there is a setting in the dashcam to have it turn off when the battery reaches a certain voltage. I had this thing hooked up in my last car, and it worked like a charm, and even caught a car accident that I got into with a 89 year old priest that drove into my lane. Insurance ruled it 50/50, and then I supplied the dashcam footage and they quickly ruled 100% priest's fault. It was a test of the crappy "he-said/she-said" insurance system. And the priest lied, and there were no witnesses because it was a minor accident and nobody bothered to stop! So money well saved because the accident would have resulted in paying a deductible and potential insurance rate increases. In my last car, I utilized the "add-a-fuse" concept to wire it up. But the location of the Explorer's fuse is very difficult to access. Also the new the 2017 uses new Micro2 & 3 fuses, which no auto parts shop carries yet. Older Explorers will be using the normal Mini fuses, that have easy access parts. I don't know when Micro2 & 3 fuses were added in the Explorer. 2016? 2017? My brother is an auto mechanic, so he hardwired it for me. He wired it into the driver's side A-pillar. There is a large molex plug, and he tapped into that. Pulling the panels off to access the A-pillar required no tools. After watching him work, it was an excellent install. Except the wire-tap failed. I had to take it apart and wire it more conventionally -- strip the wire, and tap in directly and duct tape it. Happy enough for me. The reason the wire tap failed was because the dash cam wires are just so thin. Airbags are a concern/risk, and there are cases of airbags deploying while wiring stuff up, so YMMV. I unplugged the molex before playing with the wires, and only connected it after I was done. Did that a few times without anything going awry. Also we used zip ties to wire it up behind the air bag. The molex also clips into the chassis, and you can pull it out to make it easy to work with. All the dashcam connections were made below the plug. And of course, not all cars are the same, but my loaded 2017 Explorer Sport had a red wire on the bottom that went into the plug and didn't come out the top -- so it's a live accessory wire that doesn't actually connect to anything. Who knows maybe it serves a purpose for a Platinum trim, although apparently this is a pretty common technique for car makers. So we were able to literally just cut the wire and hook the accessory wire directly to it. Platinum has a couple extra features like rain sensing wipers, lane assist, that would go up that way. The constant power was indeed being used and had a thick blue with red wire underneath and above the plug. The advantage to doing it this way instead of using fuse tap is that it's a cleaner installation and you don't have to pull as many panels to run the wires. In addition, the A-pillar is easy to access and work with. Basically he ripped out 4 panels with his bare hands, without even thinking. I would have been much more careful, but he was so fast, I only got video of 2 of the 4 panels, and I nearly had a heart attack. My new car wasn't even a week old! He didn't break anything, but did have to use needlenose pliers to reset one of the plastic hook things, so it would clip back in. Next post, I'll detail how I got the rear dash wired up. Installing the rear dashcam took me awhile, like solving a puzzle. This time I didn't have my mechanic brother to rip apart panels for me. The key part was figuring out the best way to run the dashcam cable through the rubber coiled tube. Best bet is to follow each step. Step 2, 3, and 4 were a real pain, like a Jenga problem. The headliner in the rear is very weak and fragile, but it's positioned in such a way that you can't actually pull it right down or get it around the side panels in step 2. The side panels I couldn't actually remove, as they are attached to the seat belt & speaker... though those didn't seem to be the problem. There was something else I couldn't figure out low in the panel that wouldn't unclip without risking breaking something. While I wanted to remove it to pull the the headliner, instead, I just made space so I could pull down the headliner enough so I could work with the rubber coiled tube. I used two tape measures to hold down each side of the headliner. The rubber coil pulls out from the hatch and the chassis. But the bottom was sealed -- probably heat shrink. I had to cut it off before I could feed the dashcam wire through it. I patiently wiggled and forced it through the other wires inside the coil until I could see it on the other side. Once I saw it, I used needlenose pliers to pull it through. Just be careful not to squish the contact. To be clear, I wired it along the passenger side to connect to the front dashcam. The pic looks like it's going to the driver's side, but that's just where the hatch to chassis wire tube is. So job done, everything tidy and I'm good to go. Nothing worse than getting nicked in a parking lot and the person takes off. It happened to my wife a couple years ago. No recourse. Here's some footage. All of it is rear dash footage by coincidence although still 1080p for both cameras. Car is actively driving. Insurance ruled me 50/50 fault until I supplied footage, then ruled other driver 100% fault. This was the same camera installed in my previous car -- a 2007 Honda Civic. Car is off and camera is in parking mode. Car is off and camera is in parking mode. I closed the car door to replicate a "hit". I learned a few things today, now that parking mode is properly working. It appears to constantly record to a memory buffer, and when an incident occurs it saves it to the memory card and puts the event in the middle. So it's pretty damn perfect. I can see having way too many false positives on motion detection mode, so I'll probably be turning that off. There are settings for sensitivity for both types, as well as a voltage setting. I set mine to 12.2V (that's when it'll automatically turn off). Nice work on the install. I don't use the motion detection myself... I just wind the collision detection to be almost over-sensitive. I'm going to have to wait until warranty is up before I get to the rear dashcam hardwiring (dealerships here are finicky when it comes to "electrical" mods of any sort). 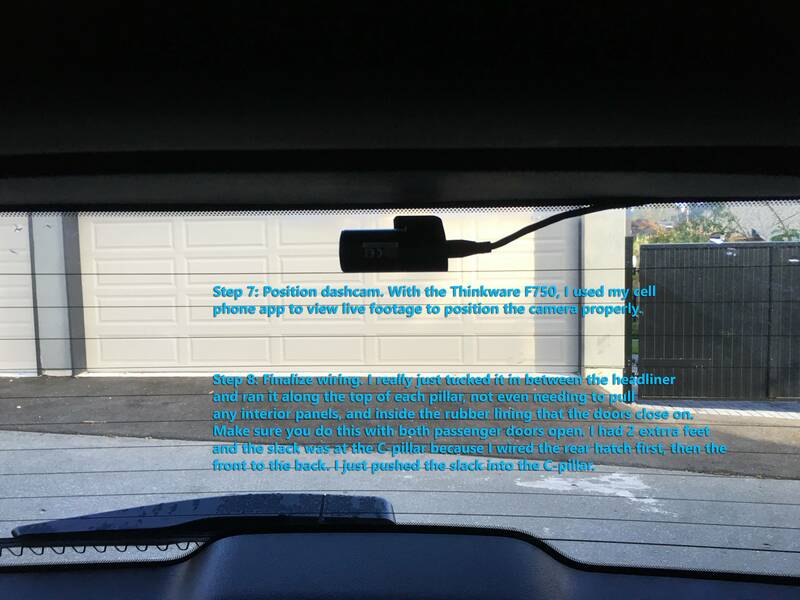 For the front, I followed another members method, tapping into the rear view mirror acc socket, using a buck regulator with a USB power cable hooked up to the dashcam (easily removable). The red accessory wire (Spare) that's in there is normally left for the OEM DVD installation. I'm told each model of Explorer has its own wiring harness. Now to save up the $400 to get the whole kit. Glad I can help! I've been using mine for a year now. The new one is the Thinkware F770, which has a couple improvements over the 750, so go for that one! Also I was wrong about one thing, the rear dashcam is 1080p, not 720p. oooh, and only about $30 more on amazon... me likey. Thanks for your write-up. 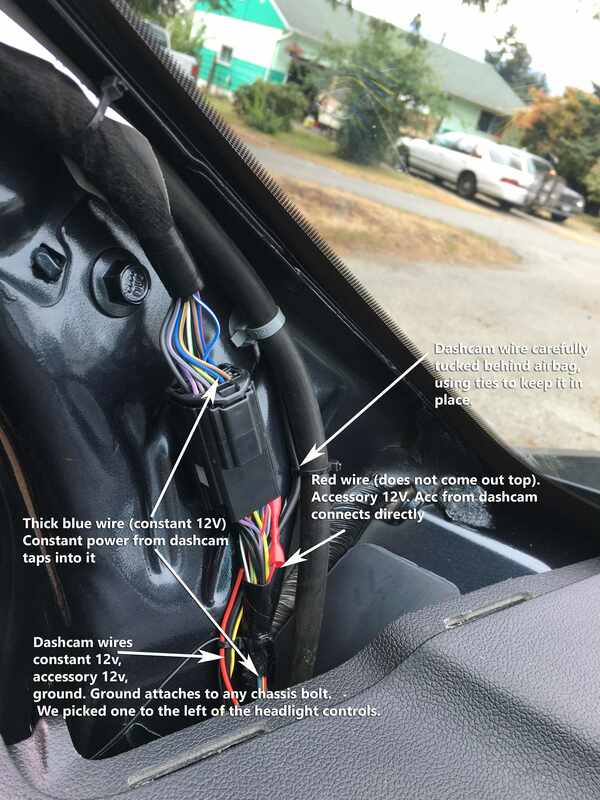 I just installed finished installing a dashcam in my 2016 Explorer Sport & your write-up was a big help in running the wires & what panels to pull & how to pull them. I'm not completely finished, though. I want to go the "Add a Circuit" route in the fuse box, however, I am unable to find one one locally that uses the "Micro 2" fuses used in our Explorers, so I had to order one via Amazon. Should be in transit now, so for the moment, I have mine poweredthrough the cigarette lighter. I decided to go with the BlackVue DR650S-2CH instead of the Thinkware that you used. 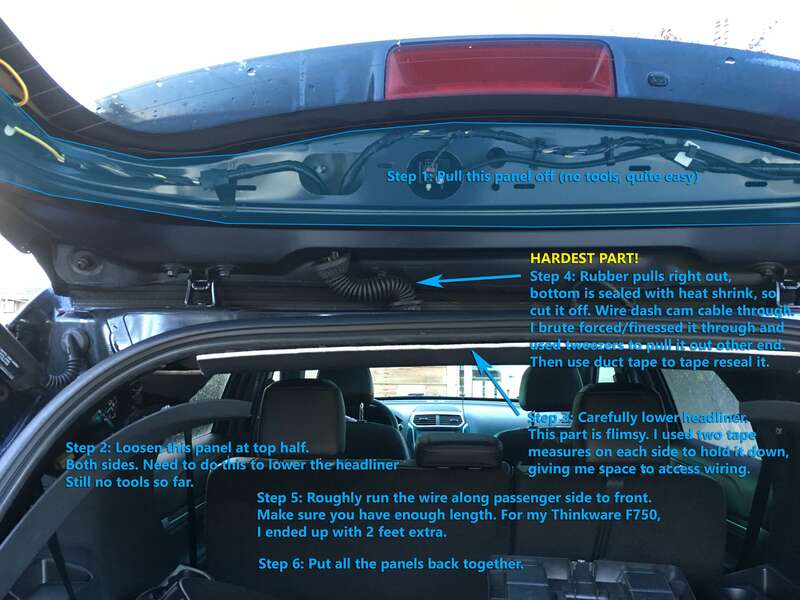 After doing this install, I did the same install on my wife's CRV, and holy hell that car was a difficult to wire up to the rear -- the headliner literally glued to the roof, trim panels also glued in key places, and the roof above the liner was sealed so I couldn't pass the wire through it. I evolved my style a little bit and was forced to get a fish tape tool to wire stuff through. It was a worthy $30 spent for me (Home Depot). But having the tool for the Ford install would have been a lot easier too... especially getting through that rubber hose that connects wiring from the rear lift gate to the chassis. So I ended up buying the F770 and installing it into my Explorer, and my wife inherited the F750. The technology inside the cameras are exactly the same, except for the cosmetic housing -- it's far more concealed/compact and the wires can be perfectly hidden. Even the firmware of the F770 can be applied successfully to the F750, and you can gain all the new features such as improved night vision and time lapse mode. So in all, worth getting. Unfortunately, I had to rewire the rear dashcam wire due to a slightly different right angle connector vs a straight connector to complete the upgrade. The hardwire kit was identical. 11.7V might be a little low for cut off, I would check the voltage of the battery after it sits over night, if it drops to around 12v each night you battery will not last as long. I have a basic Thinkware cam, having to remove the memory card is a real pain to adjust any settings or to view footage, having one that works off Bluetooth is best if you don't want a large screen stuck to the window. Ooops, I learned this was bad a long time ago. I quickly put it back to 12.2V (the default). Thanks for great tap in spot. I connected my DashCam using your "A" pillar red accessory wire tap and it worked great. Turns out its a switched accessory power wire for the rain sense auto wiper module we don't get in the Sport model. It even exposed a nice high spot to install my Cellular Remote Start RMU module that has to have good cellular coverage. Just signed up to say thank you for this post, it helped tremendously when I installed my Thinkware F770 dashcam just now! I drive a 2016 Ford Explorer Limited and the connections were almost identical. There's however one difference I would like to note (for any future readers that may want to install it in a Limited), and that is that I had to use the yellow/green cable displayed in the picture (same color in my vehicle) for continuous power instead of the blue one. I have the blue one, but it shuts off when the engine is started and the door closes (I think it's for the dome lights). The red ACC cable was the same and I was also able to use a bolt just below the A-pillar (a 9mm bolt) for neutral. As for the rear camera, I did it pretty much the same way, with the exception that I was unable to get the panel from step 1 off the car. I had to use quite a lot of force to even get it loosened up and was afraid I'd break the panel if I continued. Instead, I used the cable clamps that were provided to run it over that panel and into that cable thing from "step 4" (which interestingly enough, was one of the easier parts of the install). I drive a 2016 Ford Explorer Limited and the connections were almost identical. There's however one difference I would like to note (for any future readers that may want to install it in a Limited), and that is that I had to use the yellow/green cable displayed in the picture (same color in my vehicle) for continuous power instead of the blue one. I have the blue one, but it shuts off when the engine is started and the door closes (I think it's for the dome lights). The red ACC cable was the same and I was also able to use a bolt just below the A-pillar (a 9mm bolt). I'm happy to hear that you found the thread helpful. Thanks to the members who contributed. Nice. It's a matter of time before permanent dashcams are options on new cars. Can't believe it isn't already here in 2017. Yea... it's here. just not accessible, lol.